Watermelon Week! 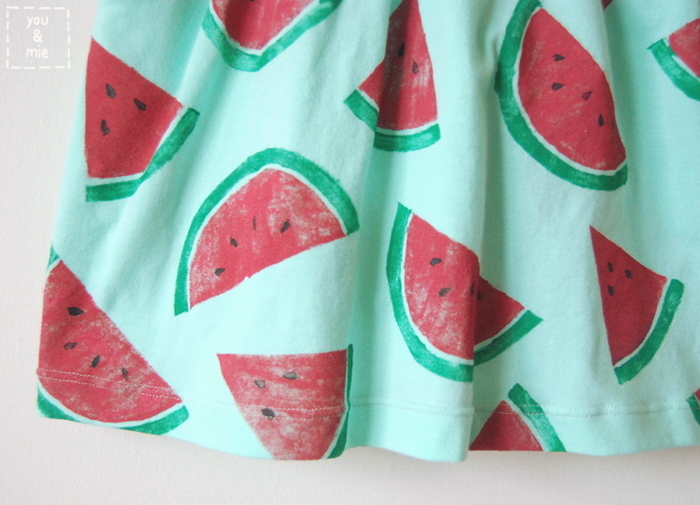 All watermelon! All the time! 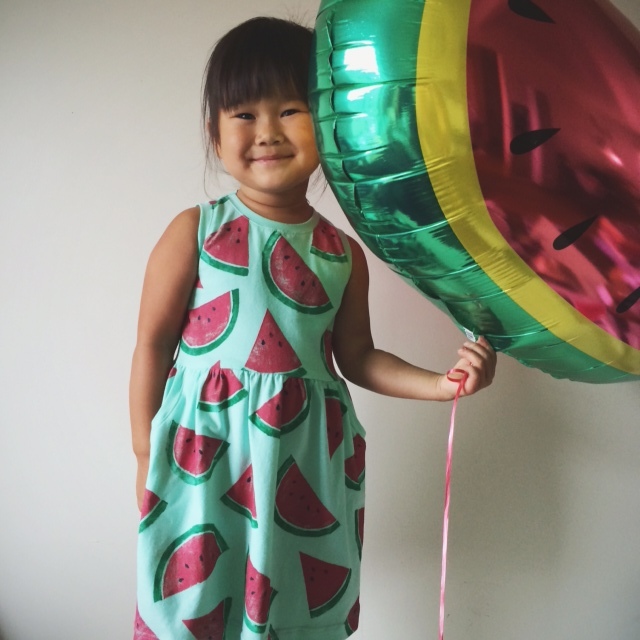 So yesterday I shared the watercolor watermelon invites that Yuki and I made for her party. 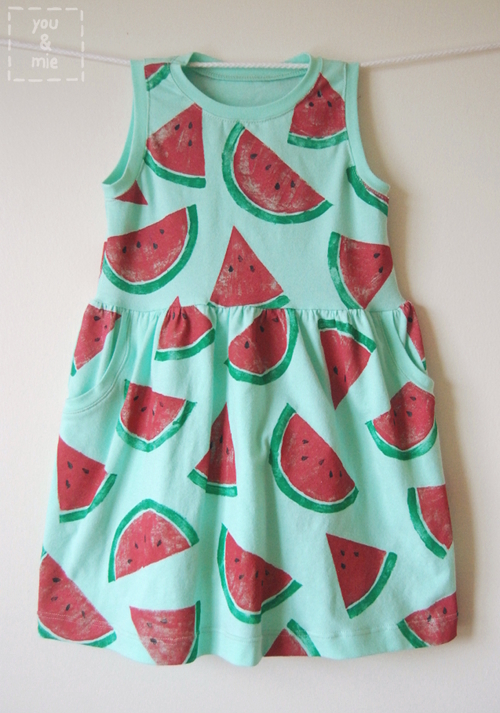 But what would a watermelon party be without a special watermelon dress? 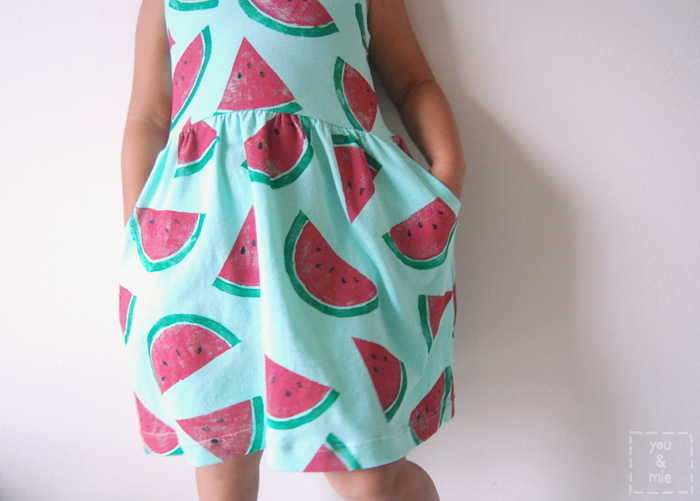 I was having a hard time deciding between a color blocked dress that mimicked a watermelon slice like this one, or a solid fabric with watermelon printed all over like this one. I was leaning toward the color blocked dress since that seemed easier, but finally I just asked Yuki and she said, without hesitation, the all over print dress. So we went to the fabric store for some solid white knit, but they didn’t have any. I let her choose between this mint french terry and light pink. Surprisingly (and thankfully), she chose the mint! I carved two watermelon shapes, one half circle and one slice. I carved away a line to separate the rind from the fruit. Probably the most simple stamps I’ve ever made! I also carved a small tear shape for the seeds. 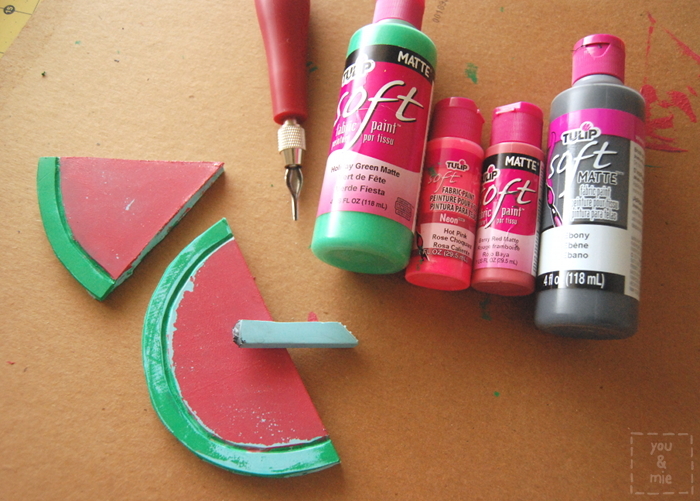 I used Tulip “soft” fabric paint and painted pink/red and green on to the separate sections of the stamp. I ended up with impressions that were uneven and slightly faded in some spots, but I like how it looks. I filled in any spots that really needed paint with a brush and then added the black seeds when the first layer was dried. My favorite part about these paints is that they don’t need to be heat set. I’ve found it easiest to cut out my fabric pieces first and then stamp so I have an idea of how things are going to look on the finished garment. I also considered letting Yuki help me with stamping, but quickly realized that it would have just driven me crazy. I could picture her dropping the stamp all over the fabric and placing the watermelons wherever and it just being a mess. I’m a bit too much of a control freak for that. The pattern I used is the Soleil Dress by Selvage Designs. This is the third time I’ve made this pattern and it’s pretty clear that I really like it. I just wanted a simple knit dress and I love the shape of this pattern, plus I knew the fit would be perfect. I opted for the closed back version, just to keep it simple, though Yuki did ask where the back hole was! I like how basic the dress is – it really lets the printed fabric shine. I’ve definitely started to make dresses that I know will get worn a ton, as opposed to a special occasion dress. I wanted something that she could wear at school or to the park. Well, mission accomplished! 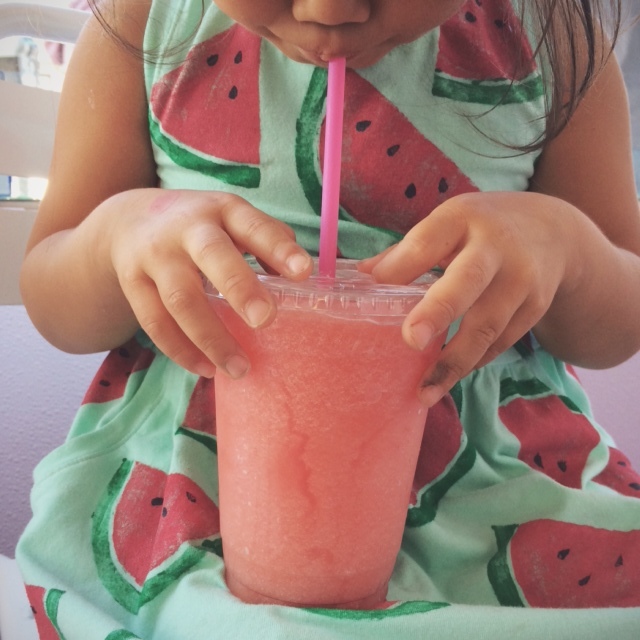 Watermelon Slushie! Definitely a must for the birthday girl. And with her birthday balloon (purchased here – affiliate link)! Still can’t believe how “big girl” she’s getting! Definitely not a toddler anymore. In fact, sometimes I feel like I’m dealing with a teenager already 😛 Oh, the attitude I get from this girl! 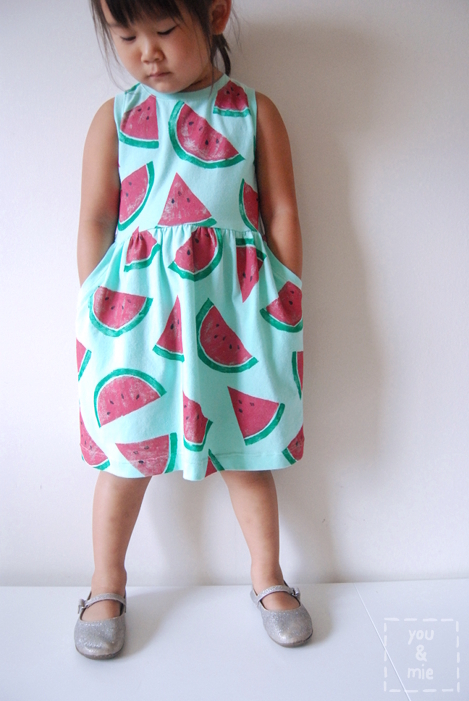 One more watermelon project to share later this week! Am I making anyone hungry yet? 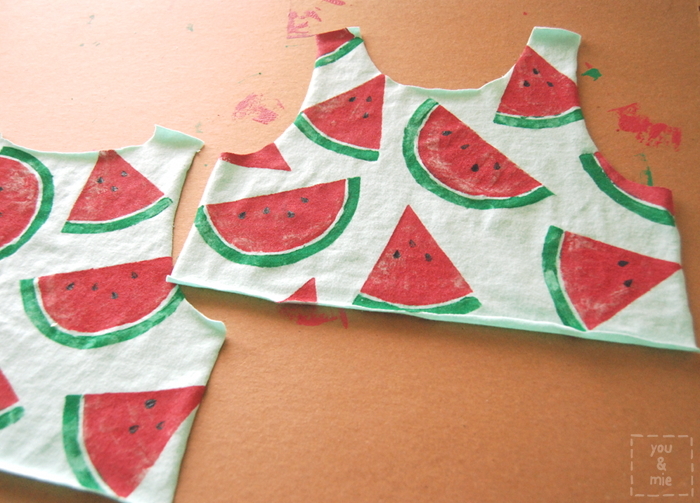 This entry was posted in party, sew & tell and tagged girls, kids clothes, watermelon dress, watermelon party by Cherie. Bookmark the permalink. Amazing – so cute – just like the invites! I have been toying with the idea of block printing jersey myself but was nervous that the designs might ‘crack’ on a knit fabric. This has definitely given me the inspiration to give it a go. I think getting even prints are hard and there is definitely the cracking issue on knits. But if you’re ok with an imperfect image, definitely try it out! And make sure not to put the paint on too thick, or it really will crack! one watermelon project is better than the other! can’t wait to see the next! How fun! I love this so much, very creative and unique party idea :). The slightly iffy printing works really well. A perfectly painted stencil wouldn’t look as good as the scratchy effect from the stamps. Love this, and very good call on taking control of the painting. She can all the fun on her birthday, this was your bit!! Happy birthday Yuki! What an amazing and yummy dress your Mom made for you to celebrate in; so fun! Happy Birthday Yuki! I thought that this was a bought printed fabric….I am try impressed that you printed this yourself! Wow!! Looks so great! Happy Birthday, Yuki! oh the cuteness!! I love your fabric printing – elevates the dress to something incredibly special. and I’m impressed by how you let Yuki choose the background fabric – I need to get better with letting go like that. Thankfully Yuki has great taste and this dress is fantastic! fantastic, looks really good. 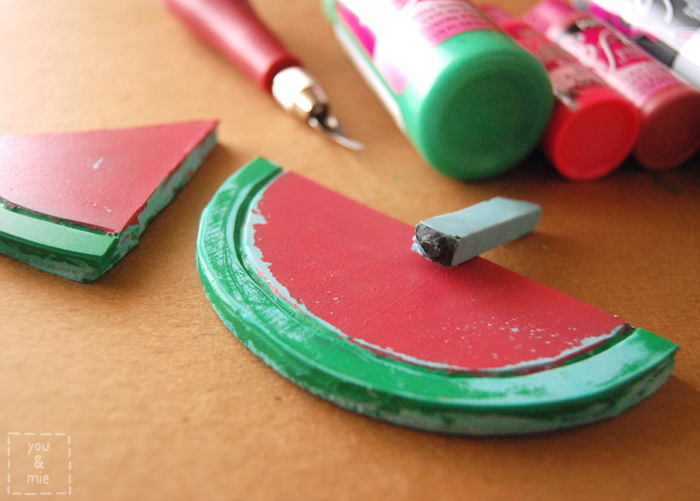 what do you use to carve your stamps from? Thanks! I use Speedball Speedy Cut blocks. This idea is so cute and creative. I have to try this. This actually made me want to eat watermelon… Love it, Cherie!!! Sorry if this is a silly question but what did you make the stamps out of? Not a silly question at all! I totally should have mentioned it in the post. I use Speedball Speedy Cut blocks. They are soft like erasers, so easy to cut. out of proportion, becoming dubious claims eagerly accepted as fact. 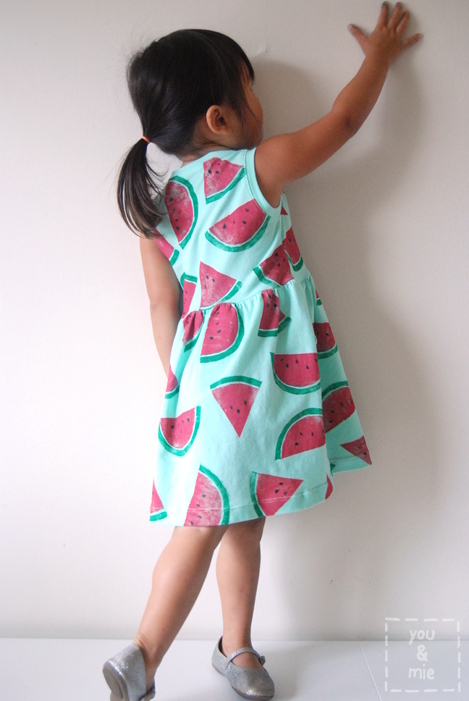 Thanks for finally writing about >Watermelon Dress | you and mie <Loved it! Gah, thus is so GENIUS! I love the blocked print effect and the fresh summery feel of the whole dress. And of course, Yuki looks fab in it!